Strider HIIT Blast: a 30-45 minute, high intensity cardiovascular workout that will include intervals on and off the M5 Strider. 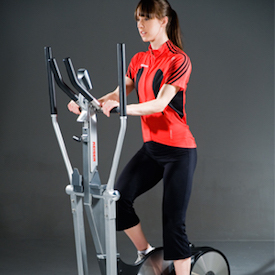 Each strider interval will be followed by a short burst of cardio or strength drills on the bench or mat. This class will be limited to first 10 participants and will not include a lot of rest! Pick up your class ticket at the front desk to reserve your spot. Striders will be given out on a first come, first serve basis. Fun, new equipment and class! Try it out! Group Exercise Director Kathy - Kathy was AFAA certified in 1997 and has been teaching classes at MAC since 1999. Kathy has taught a variety of formats including kickboxing, strength training classes, Tabata, and step. Kathy is a graduate of Louisiana State University where she competed as a diver. She participated in the 1992 and 1996 Olympic Trials in platform diving. Currently, Kathy is a Social Studies teacher at Turpin High School and is the Head Volleyball Coach. Kathy has also run two marathons, including the Boston Marathon in 2005. Athletics and fitness have always been a fixture in Kathy’s life and it is very rewarding for her to know how much group exercise impacts her participants. Not only does Kathy believe group exercise provides members great workouts but the relationships built at MAC last a lifetime and keep the members coming back.